On June 10, early Sunday morning, ACS and Youth Ministries members from the Allegheny East and Chesapeake conferences, as well as volunteers from the community, gathered together at the Miracle City SDA Church to help with 'Muck Out' in response to the Ellicott City flooding. Despite the uncertain weather, there were 55 individuals who came prepared to work in more than ten areas that had been affected in Baltimore and Catonsville. They headed to the Stillmeadow Community Fellowship Church where the Operations Center was housed. The ACS DR team connected with Team Rubicon, a national partner of ACS DR, and discussed the activities of the day which included removing furniture, carpet, drywall, and etc. Individuals were placed into teams of seven where each team member was provided a skilled worker to accompany them and direct their efforts. Each home they visited was close to a waterway that had produced a river-like water out in the streets. Much of the wet boxes and furniture still held water from over two weeks ago. Additionally, some of the homes had already begun to develop mold. Since much of the work took place inside homes, the DR Teams were able to talk to the residents of the affected homes about the rushing waters that devastated their community. 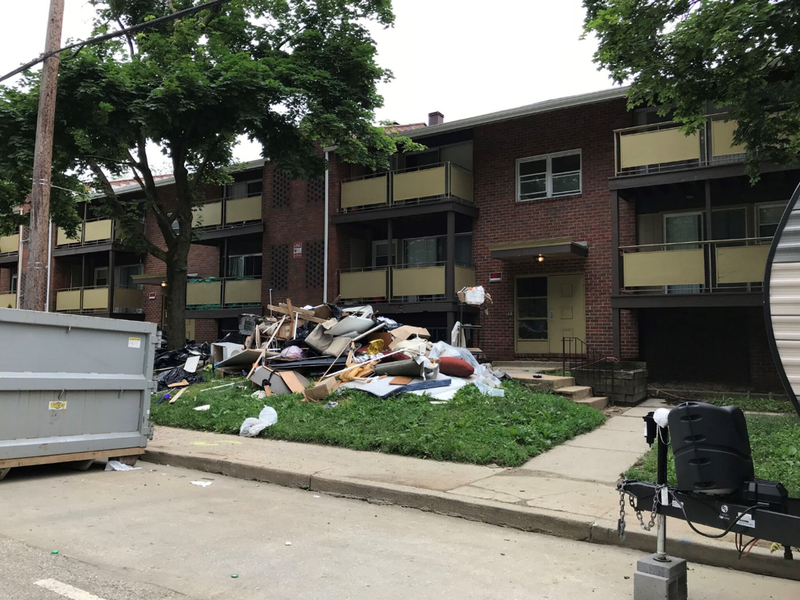 While many were sincerely grateful to get their homes cleaned out of the remaining debris, some of them spoke of other needs that had not been met such as food, water, and other necessities. Since the DR Teams had gotten a briefing in the morning before heading onto the streets, they were able to provide information on a local school that had opened a Help Center for those that lived in the area. Click here to read some of the stories that the residents shared with us. Both the Chesapeake and Allegheny East conferences have committed to continue assisting in the days and weeks ahead. The Conferences have also expressed an interest in partnering with us in Rebuild work after the homes are cleaned out. This work will include drywall replacement, painting, flooring, and etc. These Recovery Efforts will be part of a long-term Recovery Plan and will go on for the next year.